CalMac wildlife officer Andy Gilbert on the lookout for marine life in the Minch. Over 500 marine mammals have been spotted and documented on the West Coast over the summer months as part of a Marine Awareness Programme launched by CalMac ferries. The programme was launched to highlight the vast abundance of marine mammals on different CalMac routes, with over 6,500 species of plants and animals thought to be present. A total of 14 conservation bodies have teamed up with CalMac to gather the detailed findings as well as educating passengers on each route about the environment they are travelling in, led by CalMac’s dedicated ORCA wildlife officer Andy Gilbert. And the ferry company hopes to expand the project onto more services next year. 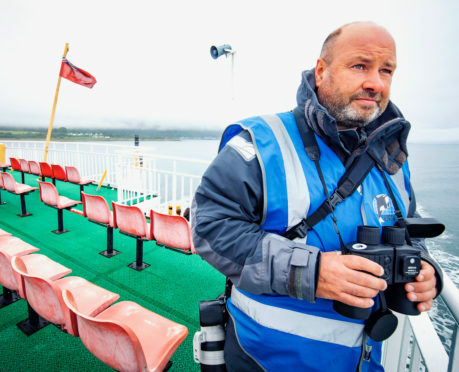 CalMac’s environmental manager Klare Chamberlain said: “Our Marine Awareness Programme focuses on increasing awareness of wildlife in our network by gathering scientific data, facilitating conservation and engaging with the public, Andy has been central to this over the past few months. A team of over 60 wildlife enthusiasts have compiled survey results that tracked different species on the different ferry routes. Mrs Chamberlain added: “As well as having a duty to help protect this environment by gathering as much data as we can, we can also play a role in promoting the wealth of wildlife we have in our area as a way of helping to sustain and grow island economies. All information gathered from the survey is compiled for ORCA, the UK whale and dolphin conservation charity.